Debut studio album from band related to the legendary Welsh band MAN. 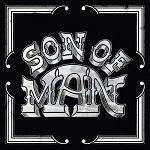 More information: The new, self-titled debut studio album by SON OF MAN. As their name suggests, SON OF MAN are related to the legendary Welsh band MAN.